I’ve been watching one of the best shows on TV and following a “second screen” on Twitter, where @nasagoddard and @nasagoddardpix have been live tweeting NASA images during Cosmos: A Space-Time Odyssey (Sundays 9:00 pm EDT/PST on Fox and Nat Geo Channel on Mondays at 10:00 pm). The show is spectacular. 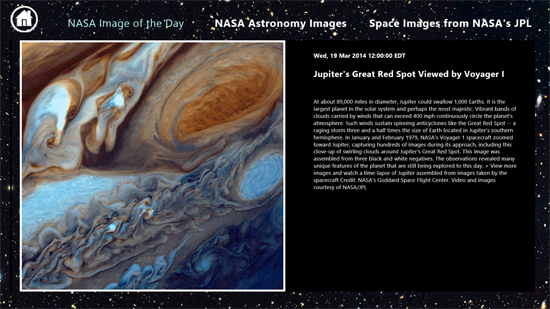 The images are jaw dropping magnificent. 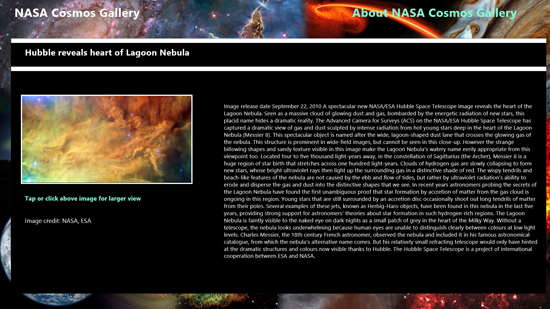 The main screen is a scrollable gallery with a large thumbnail and description. Scroll with touch or your mouse and it will snap into place and display the next item. Please download and see these amazing images! Let me know on Twitter @barbbowman if you like the app or rate it in the Windows Store. I’ve been on an app spree, in case no one noticed. 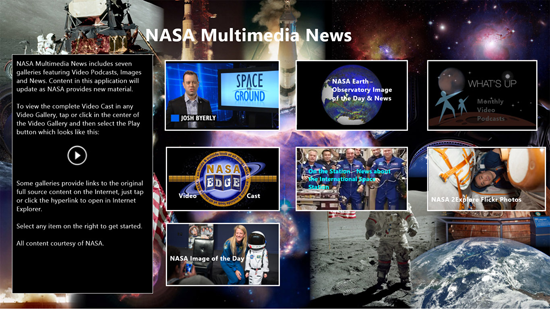 I’ve been using Microsoft Project Siena to build apps of late (in case my readers haven’t noticed) and my latest creation, NASA Multimedia News is now available in the Windows Store. 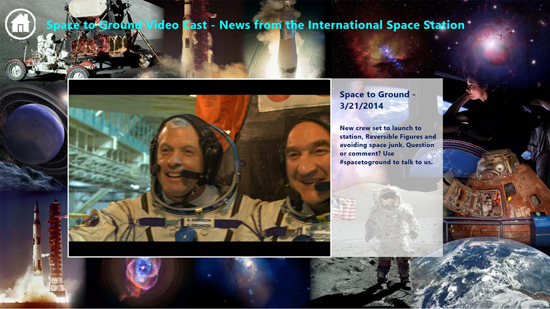 Seven sources/feeds are available, including three video podcasts. 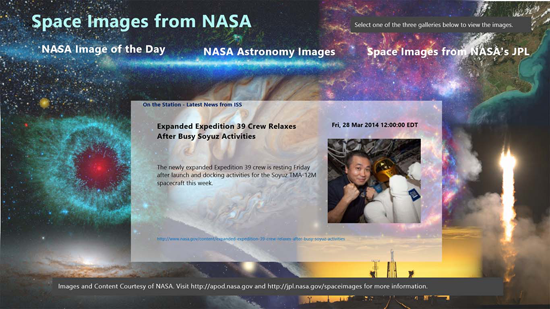 Information is updated as NASA updates their content. Here’s one of the Video Cast galleries, which all work in the same manner. They are scrollable with touch or mouse. Tap the video window and select Play or hover with your mouse and select Play. 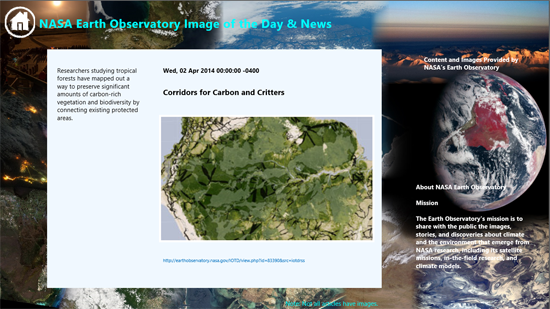 Here’s one of the News Galleries, scroll horizontally to view older entries. Thanks to everyone who provided feedback. 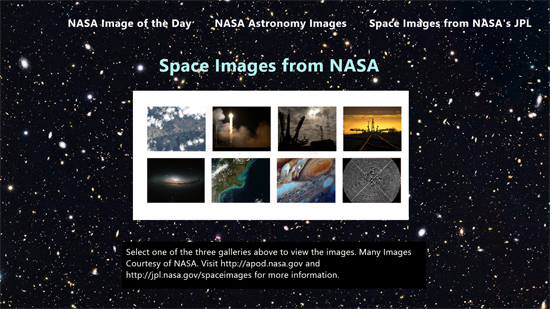 I’ve done a couple of iterations and the feature complete version of Space Images from NASA is now available. The version number (Charms, Settings, About from inside the app) will display V1.1.0.5. If you have an older version, you can manually check for updates in the Windows Store. There will be another update soon but it is cosmetic only. 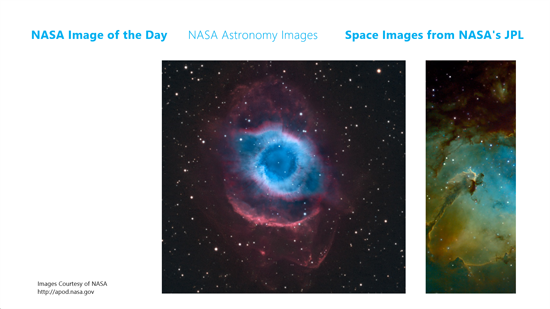 NASA Astronomy Images and Space Images from NASA’ JPL are pulled via a behind the scenes Bing search and no description/caption is available, however, you now can display the source image in Modern IE by tapping or clicking an individual image in the Gallery. 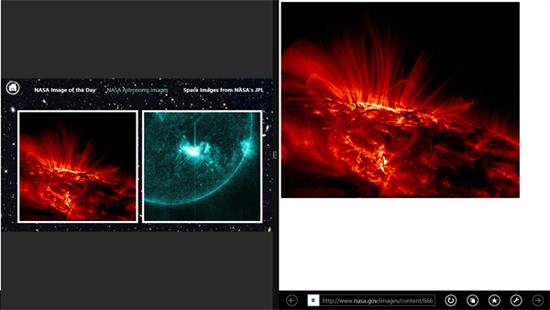 The browser will launch and fetch the image (some of these are quite large and will not appear instantaneously). 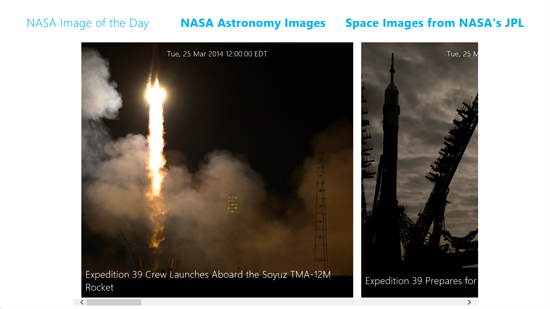 I’ve updated my Space Images from NASA App for Windows 8.1 with lots of aesthetic changes and made it available world wide. I created this App with Microsoft Project Siena Beta 2 and have been tweaking it for the past day or so. 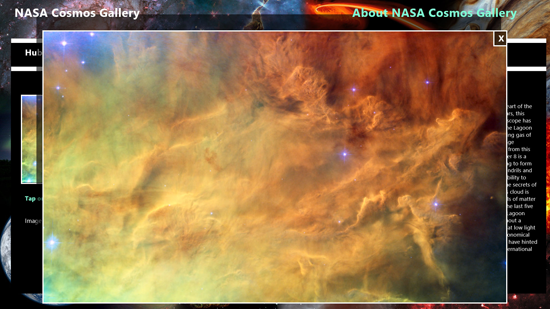 The App pulls the images and information from various nasa.gov websites and displays in one of the three galleries. 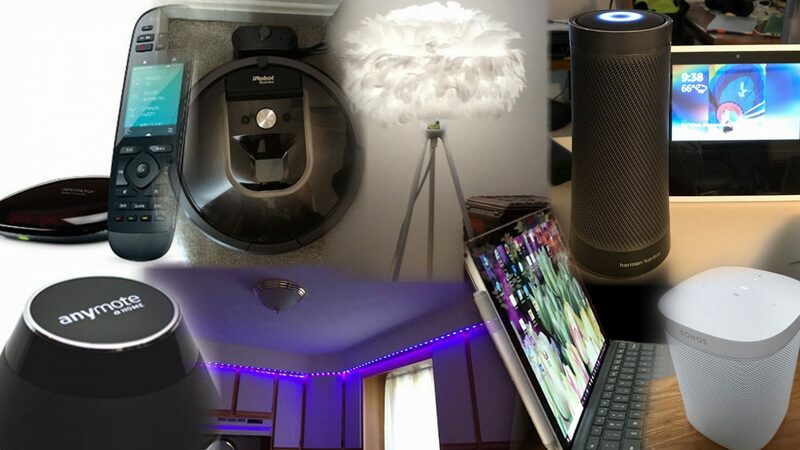 Project Siena has a plethora of great features. I’ve love pictures from beyond our small planet. Project Siena gave me the incentive to build an app that displayed the types of images that I wanted to see. The reaction has been great, and I received encouragement to release it world wide after a limited release. I’ve refined the interface and refined the search criteria behind the scenes. To build this app, I used REST and Big Search Services. The result was better than I even imagine. Please download and rate if you’re interested in this kind of content. Of course, this is a free App. Microsoft Project Siena Beta 2 arrived Tuesday afternoon with some new bells and whistles and refinements. 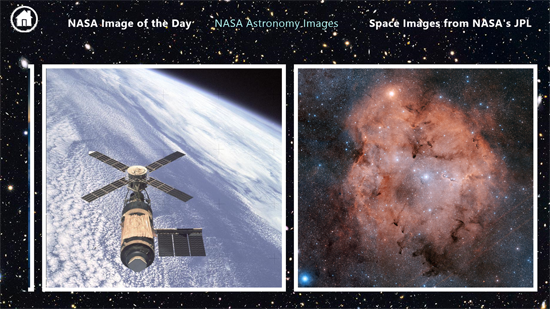 I’d been thinking about a way to pull in some space images from NASA, and the arrival of Beta 2 provided the incentive. 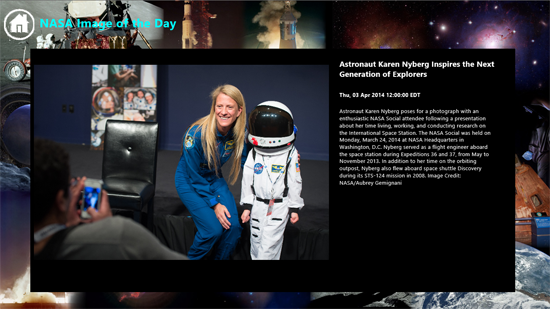 Thus, my Space Images from NASA App was born. 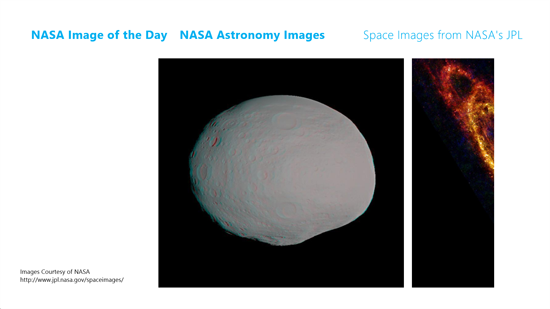 MS Project Siena let me build an app in less than an hour using the Bing Search API to pull general images and I used REST to pull the NASA large image of the day. I really should have subtitled this post “continuing my love affair with Microsoft Project Siena”. 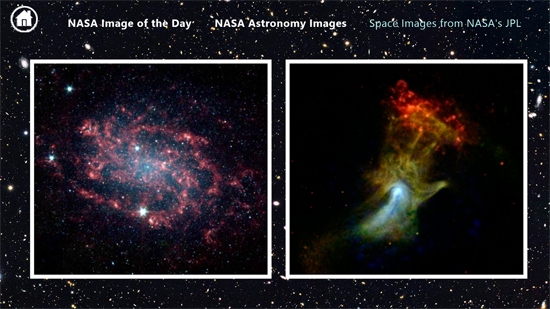 Please try out my (free) Space Images from NASA App.